Internationally recognized as one of the world’s finest quartets, the American String Quartet has spent decades honing the luxurious sound for which it is famous. 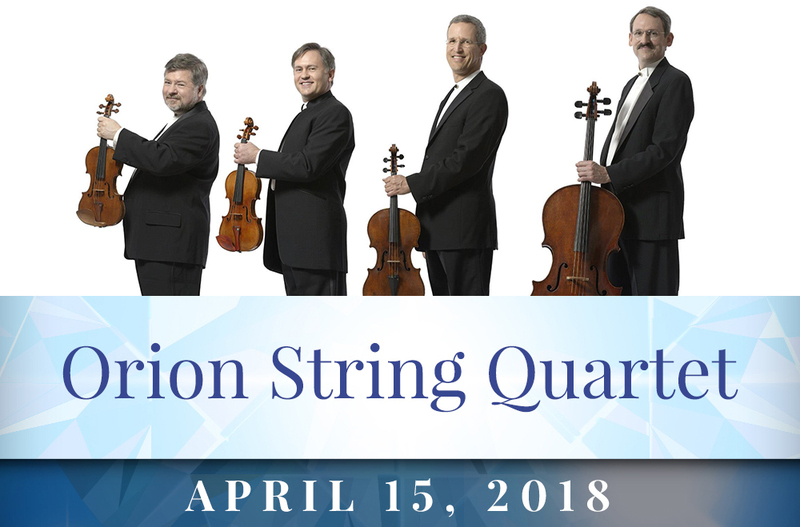 The Quartet will celebrate its 45th anniversary in 2019, and, in its years of touring, has performed in all fifty states and has appeared in the most important concert halls worldwide. The group’s presentations of the complete quartets of Beethoven, Schubert, Schoenberg, Bartok, and Mozart have won widespread critical acclaim, and their MusicMasters Complete Mozart String Quartets, performed on a matched quartet set of instruments by Stradivarius, are widely considered to have set the standard for this repertoire. In 2017-18 the American String Quartet created “Lyric in Time of War”, a major project in collaboration with National Book Award-winner, Iraq War veteran Phil Klay and Academy award-winning poet, war journalist Tom Sleigh in a groundbreaking, culturally significant program combining music and readings that examines the effects of war on people, their hearts, and their minds. Phil is a former U.S. Marine who served in Iraq, and Tom has reported on the bloody conflicts in Lebanon, Somalia, Iraq, and Libya. Short readings are interspersed with music such as Samuel Barber’s stunning Adagio; Bela Bartók’s March from Quartet No. 6, which captures the unendurable grief of war written in 1940 at the beginning of WWII; Shostakovich’s String Quartet No. 8, a piece famously dedicated to the victims of fascism and war; and Beethoven’s “Serioso”, composed during Napoleon’s invasion of Vienna and a period of serious inner turmoil for the composer. This program offers two perspectives on war; it acknowledges the hardships while recognizing and celebrating the sacrifices made by our veterans. Phil Klay is a graduate of Dartmouth College and a veteran of the U.S. Marine Corps. He served in Iraq’s Anbar Province from January 2007 to February 2008 as a Public Affairs Officer. After being discharged he received an MFA from Hunter College of The City University of New York. Klay’s New York Times-bestselling short story collection won the National Book Award for Fiction in 2014. Redeployment also received the Marine Corps Heritage Foundation’s James Webb award for fiction dealing with U.S. Marines or Marine Corps life, the National Book Critics’ Circle John Leonard Award for best debut work in any genre, the American Library Association’s W. Y. Boyd Literary Award for Excellence in Military Fiction, the Chautauqua Prize, and the Warwick Prize for Writing; and was short listed for the Frank O’Connor Prize. He was also named a National Book Foundation ’5 Under 35′ honoree. Klay’s writing has appeared in the New York Times, the New York Daily News, Washington Post, Wall Street Journal, Newsweek, Tin House and the Brookings Institution’s Brookings Essay series. Tom Sleigh is the author of ten books of poetry, including Army Cats, winner of the John Updike Award from the American Academy of Arts and Letters, and Space Walk which won the $100,000 Kingsley Tufts Award. In addition, Far Side of the Earth won an Academy Award from the American Academy of Arts and Letters, The Dreamhouse was a finalist for the Los Angeles Times Book Award, and The Chain was a finalist for the Lenore Marshall Prize. Station Zed was published in 2015 and includes his long poem about Iraq, “Homage to Basho,” a version of which received Poetry Magazine’s Editors Prize. In 2018 a book of prose collecting his essays on refugees in the Middle East and Africa, The Land Between Two Rivers: Writing In An Age Of Refugees, is being published simultaneously by Graywolf Press as a companion piece to House of Fact, House of Ruin, his latest book of poems. He has also published a previous book of essays, Interview With a Ghost, and a translation of Euripides’ Herakles. Widely anthologized, his poems and prose appear in The New Yorker, Virginia Quarterly Review, Poetry, American Poetry Review, Yale Review, Threepenny, The Village Voice, and other literary magazines, as well as The Best of the Best American Poetry, The Best American Poetry, Best American Travel Writing, and The Pushcart Anthology. He has received the Shelley Prize from the Poetry Society of America, a Fellowship from the American Academy in Berlin, a Fellowship at the Civitella Ranieri Foundation, an Individual Writer’s Award from the Lila Wallace/Reader’s Digest Fund, a Guggenheim grant, and two National Endowment for the Arts grants, among many others. “Lyric in Time of War” has been an incredibly successful program all over the country, as it speaks to the very real feelings, fears, and hopes of Americans. In addition, the outreach opportunities are vast: the musicians and authors have worked in VA hospitals, taken questions and bookstores, met with veterans’ groups privately. It’s a way to really make an impact on the community. The program, around 80 minutes, will be performed without intermission. Readings will take place in between musical movements, creating an exciting and moving sound collage. The concert is a dialogue between the spoken word and music, summoning the power of both to transform and inspire. Since its inception in 1992, the Brentano String Quartet has appeared throughout the world to popular and critical acclaim. Within a few years of its formation, the Quartet garnered the first Cleveland Quartet Award and the Naumburg Chamber Music Award; and in 1996 the Chamber Music Society of Lincoln Center invited them to be the inaugural members of Chamber Music Society Two, a program which was to become a coveted distinction for chamber groups and individuals. The Quartet had its first European tour in 1997, and was honored in the U.K. with the Royal Philharmonic Award for Most Outstanding Debut. That debut recital was at London’s Wigmore Hall, and the Quartet has continued its warm relationship with Wigmore, appearing there regularly and serving as the hall’s Quartet-in-residence in the 2000-01 season. In recent seasons the Quartet has traveled widely, appearing all over the United States and Canada, in Europe, Japan and Australia. It has performed in the world’s most prestigious venues, including Carnegie Hall and Alice Tully Hall in New York; the Library of Congress in Washington; the Concertgebouw in Amsterdam; the Konzerthaus in Vienna; Suntory Hall in Tokyo; and the Sydney Opera House. The Quartet has participated in summer festivals such as Aspen, the Music Academy of the West in Santa Barbara, the Edinburgh Festival, the Kuhmo Festival in Finland, the Taos School of Music and the Caramoor Festival. Joining a rare natural warmth with a fierce commitment to the transforming communicative power of music, Dawn Upshaw has achieved worldwide celebrity as a singer of opera and concert repertoire ranging from the sacred works of Bach to the freshest sounds of today. Her ability to reach to the heart of music and text has earned her both the devotion of an exceptionally diverse audience, and the awards and distinctions accorded to only the most distinguished of artists. In 2007, she was named a Fellow of the MacArthur Foundation, the first vocal artist to be awarded the five-year “genius” prize, and in 2008 she was named a Fellow of the American Academy of Arts & Sciences. From Salzburg, Paris and Glyndebourne to the Metropolitan Opera, where she began her career in 1984 and has since made nearly 300 appearances, Dawn Upshaw has also championed numerous new works created for her including The Great Gatsby by John Harbison; the Grawemeyer Award-winning opera, L’Amour de Loin and oratorio La Passion de Simone by Kaija Saariaho; John Adams’s Nativity oratorio El Niño; and Osvaldo Golijov’s chamber opera Ainadamar and song cycle Ayre. It says much about Dawn Upshaw’s sensibilities as an artist and colleague that she is a favored partner of many leading musicians, including Gilbert Kalish, the Kronos Quartet, James Levine, and Esa-Pekka Salonen. In her work as a recitalist, and particularly in her work with composers, Dawn Upshaw has become a generative force in concert music, having premiered more than 25 works in the past decade. From Carnegie Hall to large and small venues throughout the world she regularly presents specially designed programs composed of lieder, contemporary works in many languages, and folk and popular music. A five-time Grammy Award winner, Dawn Upshaw is featured on more than 50 recordings, including the million-selling Symphony No. 3 by Henryk Gorecki for Nonesuch Records.